Who can't wait to get out and catch some fish? The weather and fishing conditions have been so poor lately that it has been difficult to catch fish consistently. Water conditions ...up lake 41* and muddy to heavy stain, mid lake 44* and slight stain, down lake 48 and clear. Weather patterns...Every other day a front blows through, the barometer is constantly changing, rain is keeping the water up lake stained, water temps rise a degree or two then plummet the next day, Wind howls so bad you cannot control the boat, just to name a few of the issues that control the success of catching fish recently. 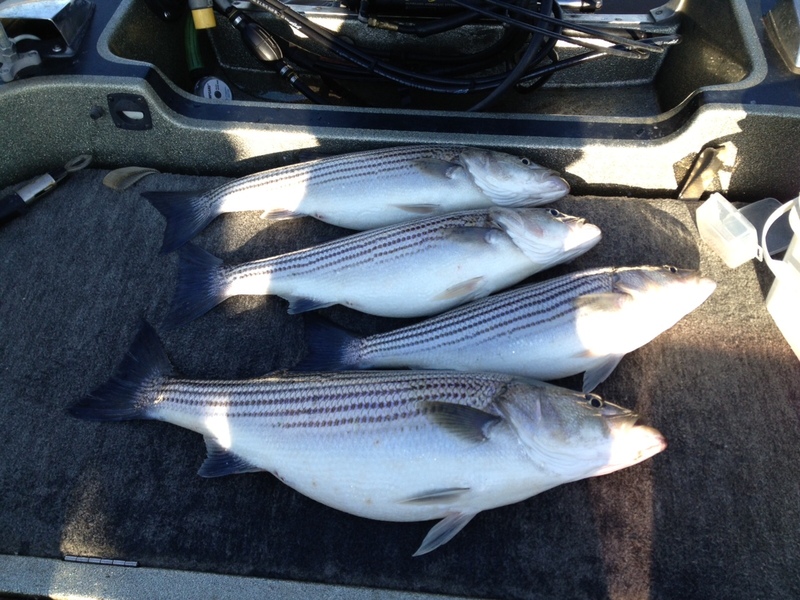 Another issue affecting Striper fishing lately has been the amount of bait in the lake. Due to warmer winters over the last 4 or 5 years there have been minimal bait kills resulting in too much bait in the lake. We are seeing areas of the lake where the bait is from top to bottom for up to a half a mile. Fish are in the bait and don't have to eat our offerings. The Stripers we are catching are stuffed with 1 and 2 inch baits and the Crappie are full of 3 to 4 inch Threadfin. Brian went out yesterday afternoon and caught some nice Stripers in just a couple hours on 2 inch Threadfin. Anthony caught his fish in the middle of a sunny day on the edge of a channel and Tony caught his nice fish in the middle of the lake over 22 feet of water on a bobber. Once the water warms a few degrees and the weather patterns stabilize Striper fishing should be off the charts. The winter doldrums will soon be over with March ushering in warmer temperatures putting the Stripers in a feeding frenzy!